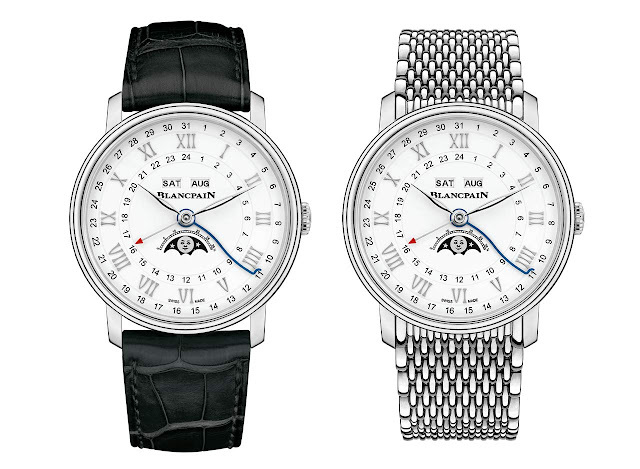 Since the early 1980’s, Blancpain’s complete calendar moonphase timepieces have been a signature of the brand. 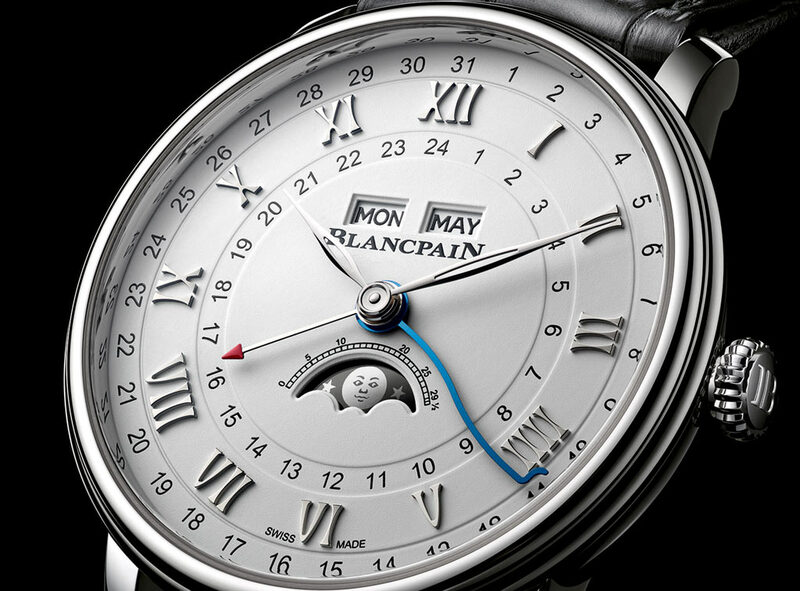 In 2002, the two complications were enriched by a GMT function and, since then, a model with complete calendar, moonphase display and GMT has always been in the Blancpain catalogue. 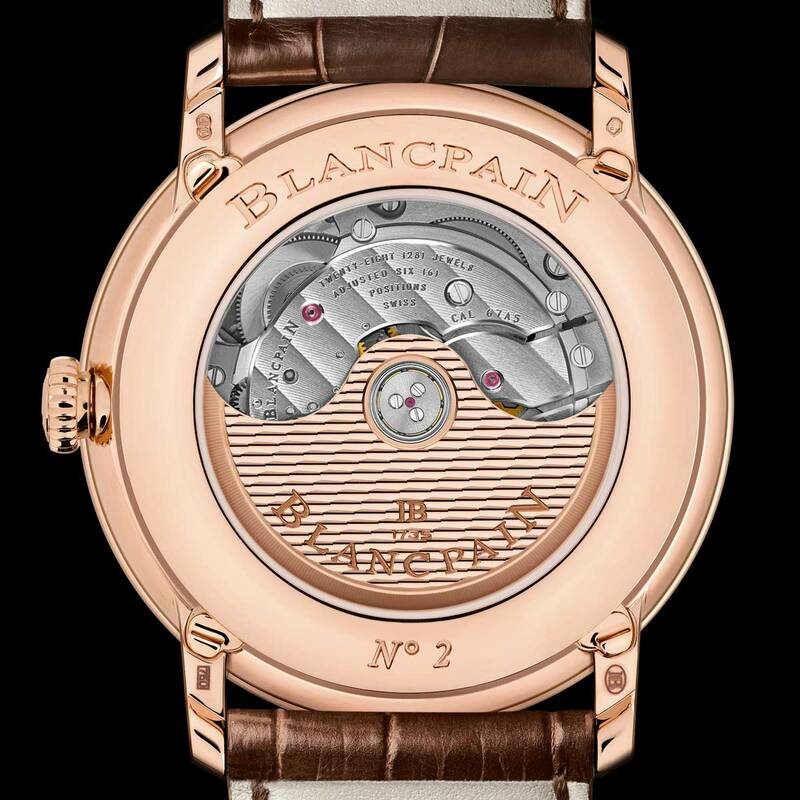 For Baselworld 2018, the Swiss manufacture reinterprets this practical complication with the new Quantième Complet GMT enhancing it with Blancpain’s patented under lug correctors. The classic dial displays the day of the week and month in windows, the date with a supplemental blued serpentine shaped hand reading upon scale positioned around the chapter ring and the moon phase with an elegant aperture at 6 o'clock. The calendar indications are linked to the local time display shown on the principal hands while home time is shown with an easily readable red tipped hand. The introduction of this combination of complications in the Villeret Collection brings with it important innovations that were developed after the original version of the Quantième Complet GMT was launched. Visible through the sapphire crystal case back, the in-house self-winding movement now features a silicium balance spring with its superior anti-magnetic and timing precision properties. Setting of all the calendar and moon phase indications with a finger tip, instead of the standard tool, is made possible with the exclusive under-lug correctors. 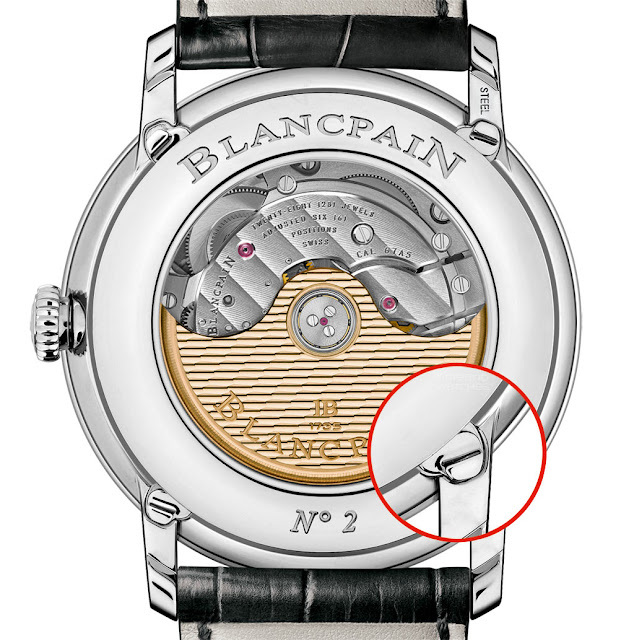 An added benefit, the hidden correctors enable completely smooth case flanks unmarred by corrector dimples, commonly found in the watch world. Rapid adjustment of local time in one hour increments is accomplished via the crown. Comprised of 286 components and beating at 28,800 vibrations per hours, the advanced Calibre 67A5 guarantees a 72-hour power reserve. There are two versions of the new Quantième Complet GMT: in red gold with an opaline dial and applied red gold Roman indexes (ref. 6676-3642), and in stainless steel with a white dial and white gold applied Roman indexes (ref. 6676-1127). Both are fitted into 40 mm diameter cases with the traditional Villeret double stepped bezel. Happy to see the availability of a steel version. Too often brands produce complicated watches only in precious metals. Nice dial. I would like to see a larger movement. 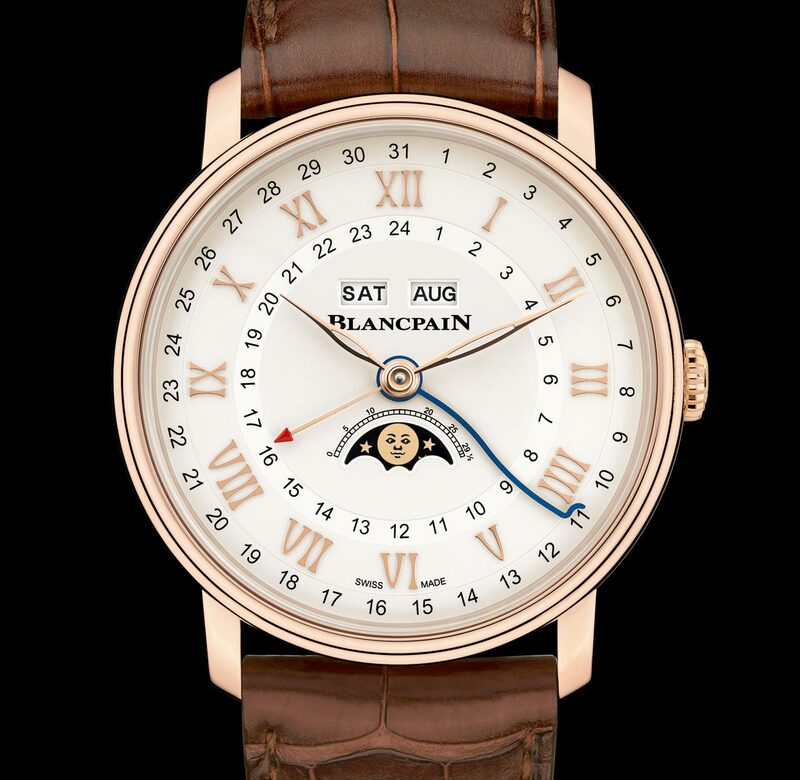 Baselworld 2018: Blancpain Villeret Quantième Complet GMT. For Baselworld 2018, Blancpain reinterprets this practical complication with the new Quantième Complet GMT enhancing it with Blancpain’s patented under lug correctors. There are two versions of the new Quantième Complet GMT, in red gold with an opaline dial and applied red gold Roman indexes (ref. 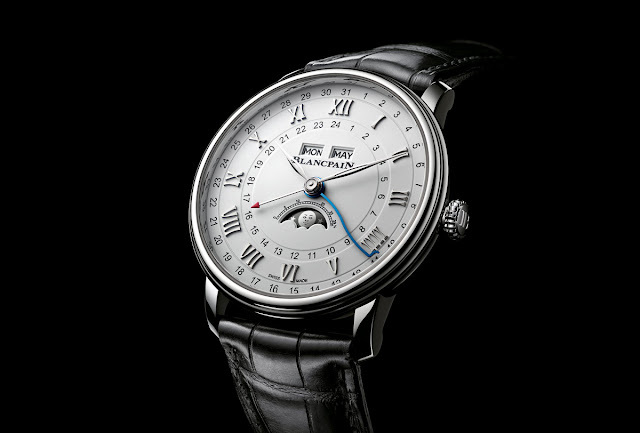 6676-3642); and in stainless steel with a white dial and white gold applied Roman indexes (ref. 6676-1127). Prices will be announced at Baselworld 2018.